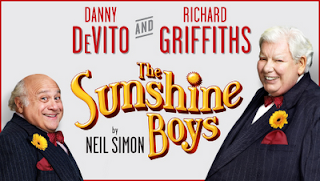 Last night Stu and I went to see The Sunshine Boys playing at the Savoy Theatre in London's glitzy West End. 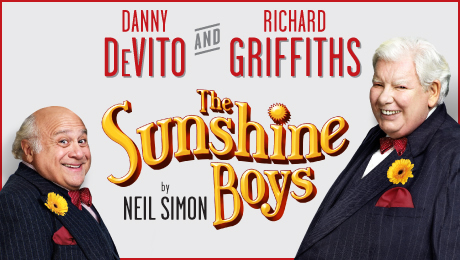 The revival of the Neil Simon comedy starred Danny DeVito (in his West End debut) and Richard Griffiths as the hapless vaudeville duo "Lewis and Clark". The story is set after the pair have split up having worked together on stage for 43 years, grown to hate each other and not spoken for their final year together. It is now 11 years later and they are being asked to revive one of the old routines one last time for a television special. Neither really wants to do it and they bicker and argue before they eventually reluctantly agree do it. They then have a war-like rehearsal before they finally get to perform. It's a funny show - very well written with some brilliantly created smaller roles such as the two diametrically opposite looking nurses. The show however hangs on the performances of it's two leads. And in this it is mild disappointing. DeVito is nothing less than superb. He is funny, engaging and convincing. Griffiths is sadly less so. His New York accent is all over the place, his timing not one of a seasoned comic actor and he comes across as being all too pensive for the quick wit he is meant to be portraying. Basically I think he's been miscast. Still, it's a good show and despite us feeling a little drained from recent bad news we both laughed - a lot - especially in the final act.